Summary: Surely the funniest film you’ll see this year. Try to imagine, if you can, The Wicker Man crossed with The Naked Gun. At that glorious intersection lies Hot Fuzz, the latest from the Shaun of the Dead team. Though retaining the same spirit as Shaun, director Edgar Wright and co-writer Simon Pegg have came up with an entirely new and fresh batch of characters and created a wonderful world for them to play in. 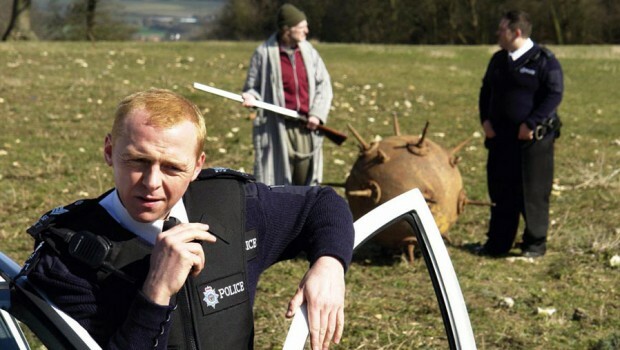 Pegg is Nicholas Angel, a London super-cop who, much to his superiors’ annoyance (lovely cameos from Martin Freeman, Steve Coogan and Bill Nighy) is just too good at his job. He’s making the rest of them look bad, so their solution is to ship him off to the country. He’s so obsessed with his work that when he arrives in the West Country village of Sanford, he immediately begins trying to clean up a town where, on the surface, nothing ever happens. At his new station, he’s partnered with Danny (Frost), the none-too-bright son of the chief (Broadbent) where he seems doomed to spend his days eating gateaux and trying to find lost swans. But when a local couple are killed in a car crash, Angel becomes suspicious of Dalton’s supermarket boss, who looks like he knows a bit too much. Before long, bodies are piling up like it was Midsomer, but only Angel believes they’re anything other than accidents.